A while back I discovered this card in a shop round the corner from my home and fell in love with it immediately. The artist (Leigh Standley) has crammed so much of what I feel into one image, and it has been pinned above my desk ever since. As many of my friends will know, I take the New Year very seriously, as a space in which I take time out to think, to dream, to plan, and above all to listen to my heart as it learns to beat more in synchronisation with Source. I take time to look back at the year – to discover the lessons learned, to look at what I have achieved, and what didn’t quite go to plan. Like for many of my friends, this has not been an easy year, and in one sense it’s a relief to say goodbye to the old and to look to a new future. And this year, I’m not placing so much emphasis on my goals – on what I want to achieve, the things I want to do, the adventures I want to have, the contribution I want to make, or the destiny I want to step in to. I’m looking to see who I can BE. As David Whyte said, “What you can plan is too small for you to live. What you can live wholeheartedly will make enough plans”. For sure, there are some things I want to achieve next year. But they are not the important things – for me, or for you. Who are we going to BE, you and I? I’m choosing to be bolder, braver, more prepared to stand up for what I believe and to speak my truth. I want to live simpler, with more passion, and more kindness. I want to have a bigger impact on the world. I want to be more magical, more connected to my Source, more in the flow, more truly alive. I want to be more loving, more peaceful, more inspired. I want to live deeper, be wiser, more grounded. And I know that as I do, people around me will discover more peace, more wisdom and experience more love themselves. 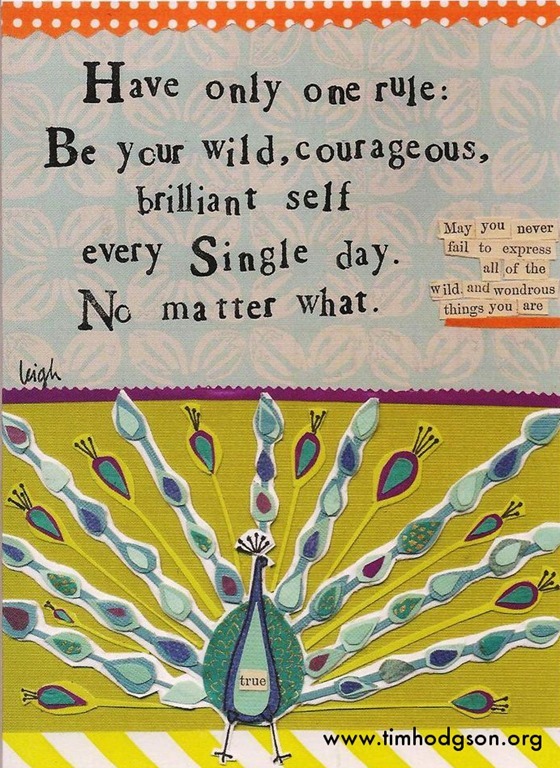 So in 2016, I choose this – to live true to myself and in the end to have only one rule – to BE my wild, courageous, brilliant self. Every. Single. Day. May you have the most magical, unlimited, abundant year ever – may you never fail to express all of the wild and wondrous things you are – and may every single one of your fabulous dreams come true. PS – it’s been a long time coming, but I’m hoping to make a ‘what’s next’ announcement next week. No promises though! 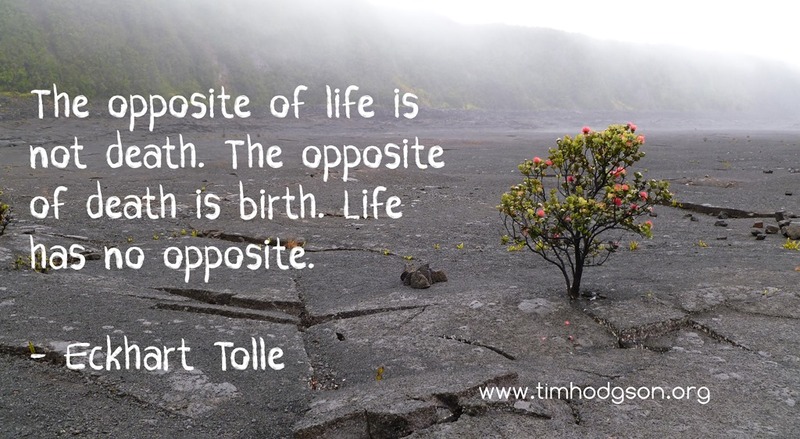 The opposite of life . . . When we’re building muscle in the gym, we gain strength by breaking the muscle down with exercise and the body then rebuilds it. 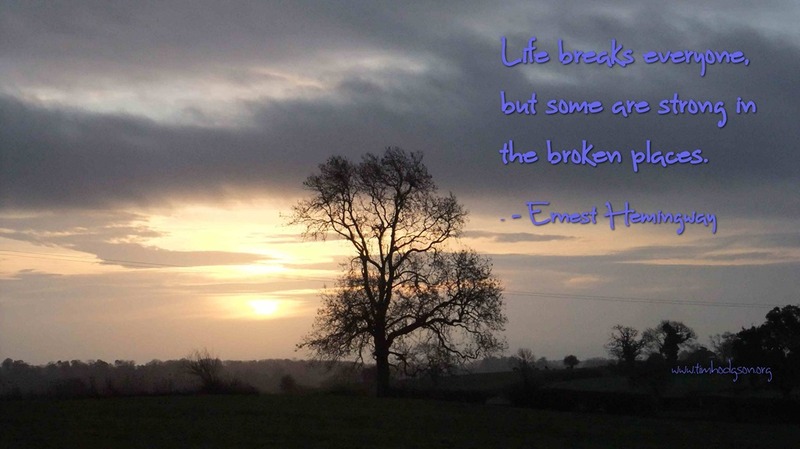 It’s the same with us.. we gain strength through the breaking, through the challenges, through what life throws at us. “I see life as a cosmic gymnasium where we have come to be broken and healed, broken and healed, for the joy of the process and because we have decided to become strong. But our bodies are just rented instruments; the part that’s here to get stronger is the Stargazer. This is how strength training goes in the soul’s gymnasium: Life breaks us. We hurt. We find the path to our North Stars and know instinctively that following them will lead to healing. We act on that instinct. We heal. we learn to trust that the path we’ve taken is the one we’re meant to take. And with every experience taken through to its conclusion, we become more able to experience joy. There are so many ways to lose the perspective of the Stargazer. Maybe right now your inner sight is clouded by the opinions of others or the horror stories of your inner lizard. Maybe you’re sun dazzled by a perfect looking surface, projecting the trappings of success but hiding the sense that you’re lost, directionless, hollow. It could be life has given you the chance to walk into the darkness, and you’ve been starting terrified at the ground beneath your feet. And maybe – quite likely in these days of dizzying change and unprecedented possibilities – no beaten path exists. 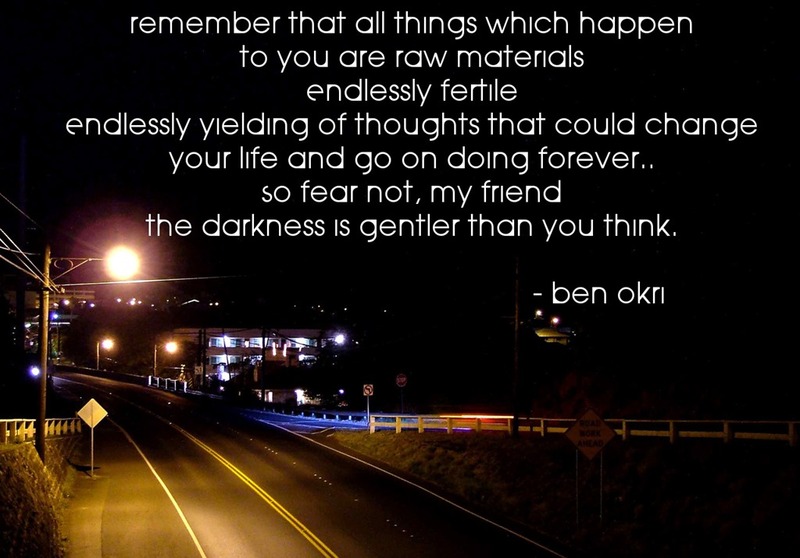 The darkness is gentler than you think…. For those of my friends going through some tough times. and for all of those who need reminding. Here be dragons . .
Do you ever have something that you read from time to time that sends shivers down your spine every time you read it? Something that stays with you and calls out to you, that seems somehow secretly significant? That sense that something infinitely precious is being communicated, that the world stops and waits to hear your response – poised, waiting with bated breath for you to hear what’s being said. And when I read that, something opens in my heart. 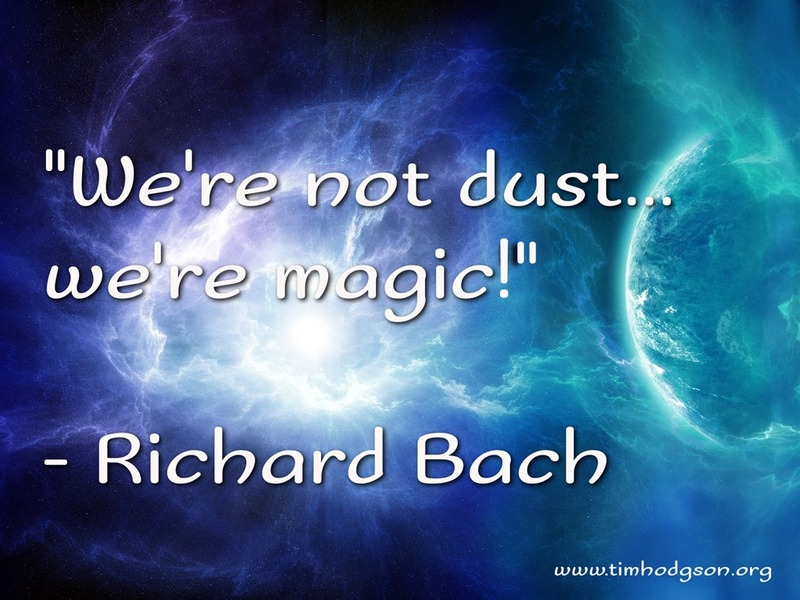 Those words come from “Bridge Across Forever” by Richard Bach. Richard, of course, is the author of “Jonathan Livingston Seagull” and “Illusions”.. but this is from the account of his love affair with actress Leslie Parrish. He writes in the introduction “This is a story about a knight who was dying, and the princess who saved his life.” And so it is. It is a story of the magic of simply being alive. Because there is magic alive in this world. Hidden away in plain sight. The crackling magic of selfless love. The fairy dust of our ability to change our lives in an instant. 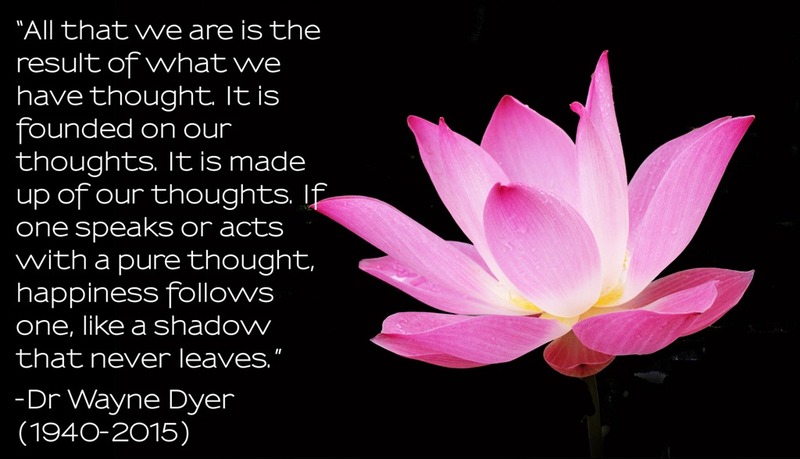 The breathtaking power of our ability to create, to transform, to change the world. Each and every one of us holds the magical power of the Universe in our hands, ready to be used for good or evil – to build up, to heal, to create – or to tear down, to curse, to destroy. It seems that we know, intuitively, that there is something else, some deeper ability lost to humanity. It’s why stories like “Lord of the Rings”, “Eragon” and the Harry Potter series seem to resonate with us. We mourn the loss of Terry Pratchett whose Discoworld series seemed be the bridge between this world and a magical universe. Films like “The Matrix” appear have more than a grain of truth to them – and isn’t the story of The Doctor simply the story of a magician.. with a box? Stories of the faerie folk, of dragons, wizards, legends of Merlin, the mystical powers of the shaman, the mythology of the Aboriginal dreamtime seem somehow real. We know, somehow, instinctively, that there is more here than meets the eye. Sometimes we catch a glimpse of it in the new physics.. the concept of quantum entanglement, the existence of the zero point field and more mysteries that unfold every day – all seem to be clues to a world where the usual rules do not apply. For sure, sometimes we fear that we’re wrong . . .
“We think, sometimes, there’s not a dragon left. Not one brave knight, not a single princess gliding through secret forests, enchanting deer and butterflies with her smile. We think sometimes that ours is an age past frontiers, past adventures. Destiny, it’s way over the horizon, glowing shadows galloped past long ago and gone. What a pleasure to be wrong. Princesses, knights, enchantments and dragons, mystery and adventure … not only are they here-and-now, they’re all that ever lived on earth! So just sometimes, just for fun, let go of the grown up act that put aside such foolish childishness. Reach back and remember a time long ago..or maybe not so far back..when for you, magic was real, and where anything was possible. Then breathe it into your soul and remind yourself: you’re not dust. you’re magic. 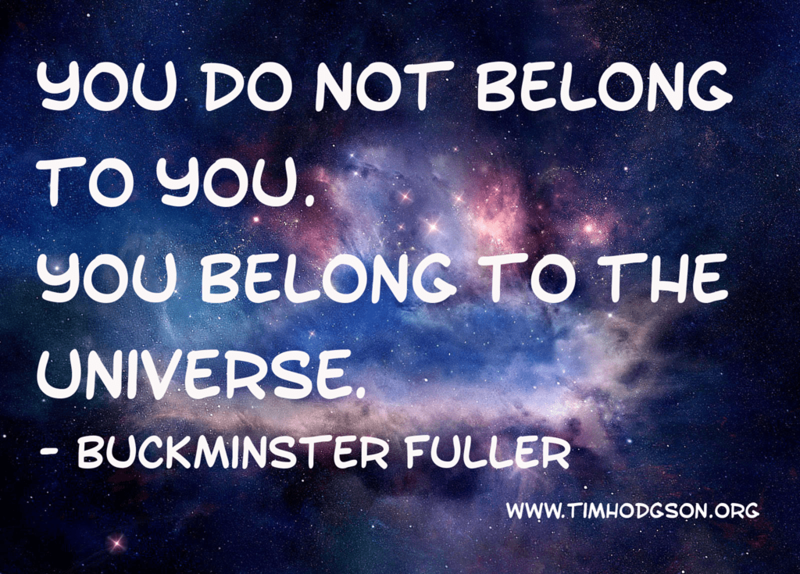 Buckminster Fuller, the architect, inventor, designer and all round smart guy, was known for popularising the geodesic dome (as used in the Eden Project) and privileged to have the rather odd carbon molecule C60 or buckminsterfullerine (bucky-balls) named after him. However, at one point in his life he was so full of despair and self doubt that he contemplated suicide, thinking that at least his family would benefit from the insurance payout. I can guarantee that the people who have been through the fire, that have found themselves changed, transformed, reforged in the transcendent heat of pain and disappointment, who have chosen to hold on because they see (or even if they can only guess at) their value to the world – those people are some of the most beautiful souls on the planet. And you are better than that. You’re the kind of person who, no matter what life throws at you, gets back up, dusts themselves off and get back in the ring again. A couple of weeks ago my son ran the London Marathon for the first time. He was hitting his target time for the run when someone cut across him and he twisted his knee. He ran the last eleven miles (ELEVEN MILES) in what he describes as the worst pain he has ever experienced. And he still beat my marathon time. In my own life I have fought my way through defeat and disappointment, through divorce, spiritual heartbreak, financial disaster and worse. I might write about it sometime. But that’s not the point. I don’t need your sympathy. The point is that I am still going. Still fighting. Undefeated. Stronger. Better. 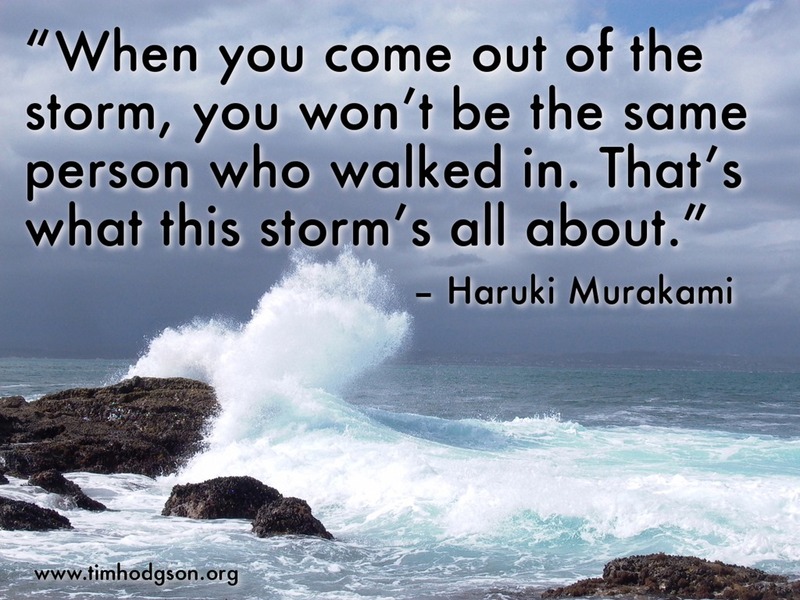 We all go through the storm. We all find ourselves tested and tried. 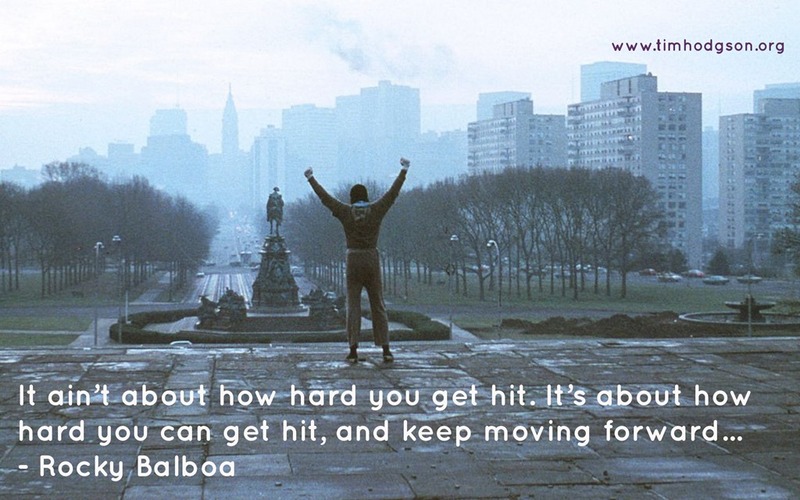 It doesn’t matter how many times we get knocked down.. as long as every single time, we get back up again. Doesn’t matter how long it takes. No-one’s counting us out of the fight. Take your time. But get back up again.